Do you find yourself angry most of the time? Does even the slightest inconvenience or difficult circumstance sometimes enrage you? Do you ever notice that your blood just seems to boil when things don’t go as you planned? If you’ve answered yes to any one of these questions, you may be suffering from something called uncontrollable anger or rage. Every time you enter a state of rage, your body becomes highly stressed. Your blood pressure goes up, your heart beats faster and your adrenaline levels increase. This is not good for the body. In fact, these reactions are supposed to serve as warning signals when danger is ahead, but when you lose control of your emotions, you open a flood gate of these reactions within the body and the repercussions are terrible. And as if the hidden effects that rage can have on the body weren’t enough, let’s not forget the clearly visible negative effects that can result when you become enraged or cannot control your anger. Inviting Confrontation Into Your Life – Every time you become enraged, you take the chance that a verbal or even physical confrontation with another person may take place. People may be offended by the way in which you are acting or what you are saying. Lack Of Better Judgment – Rage is what drives people to make bad decisions and lose control over the use of their better judgment. Rage will inevitably cause you to say or do things you may regret later on. Resentment From Friends And Loved Ones – Let’s face facts, no one enjoys being around a person that has a reputation for being able to snap at any moment. Attracting Negative Energy Into Your Life – Anger in its rawest form is negative energy and the more you harbor it in, the more it will gravitate towards you through the law of attraction. And for that reason, you need to take action today and erase the rage from your life once and for all. And I’m going to show you exactly how to do just that. 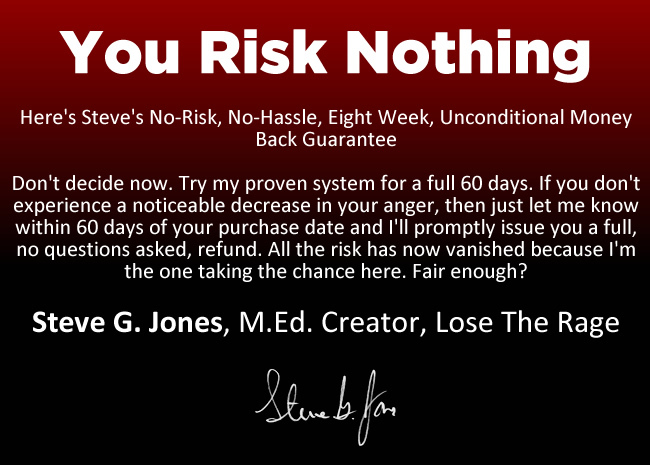 My name is Dr. Steve G. Jones, Ed.D., Clinical Hypnotherapist, and for the past 25 years, I have been helping people rid themselves of rage and anger. And now after years of research and learning what actually works, I have created a proven system that has enabled crowds of people to regain control of their lives. Consisting of 4 learning modules, this high powered program will have your rage disappearing in no time. The Eight Major Emotions And Which Ones Can Become Problematic – It’s easy to pinpoint which emotions can turn into a problem at some point. Others however, you may never suspect…until now that is. Where Anger Comes From – To fix a problem, you must first identify the root cause. Three Ways Most People Deal With Anger – Of the three, you will find out which one is the only effective choice. Seventeen Proven Techniques To Overcome Anger – Here I will divulge my time-tested techniques that will equip even the angriest person with the ability to overcome and find peace. How Phobias May Be Feeding Your Rage And How To Overcome Them - Phobias have a greater impact on your rage than you may think. Here you will learn to effectively identify them. Seven Surefire Treatment Methods For Overcoming Rage – Because long-term success is what really counts, I will show you seven ways to sustain your results. Aside from being flat-out ridiculously effective, what makes my system so great is that because it encompasses universal principles, it can be used by just about any person at anytime. And because of that, people no longer have to fly to my Savannah office for a private session (a service with a $25,000 price tag attached to it). Instead, they can reap the same rewards and gain all of the same results for just $47 $27.97! That’s right, for just $27.97 you can now own the most incisive program ever created to help you lose the rage now! 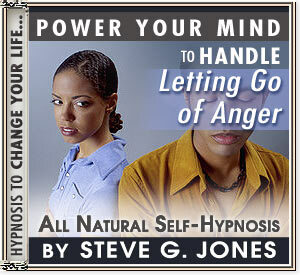 And as an added bonus, I am also going to include my "Power Your Mind to Handle Letting Go of Anger" hypnosis recording. Hypnosis works to control anger by actually getting rid of it. When a person uses hypnosis for anger, they are able to completely relax, the anger is released. Hypnosis is able to trigger more appropriate responses to stimuli so that the real emotions are expressed. Anger then becomes a thing of the past and is expressed in a controlled manner and only when an angry response is normal.